Throughout a special event held at the national art center in Tokyo to memorialize the 50th birthday of Ferrari in Japan, the Maranello-based luxury automobile company revealed a brand new totally limited collection of gorgeous vehicles, the J50– a two-seater, mid-rear-engined roadster that hearkens back to the targa body design signature of Ferrari road cars of the 1970s and 1980s. To accomplish this, the slanted leading edge of the side window,continuous with the windscreen; and the raked black swage line which significantly goes up from the low-set nose until it goes away in the air intake aft of the doors converge with each other,making a sinuous active on the flank of the car. 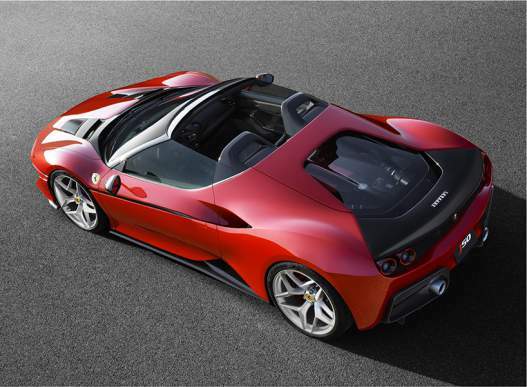 The Ferrari J50’s engine is protected by a transparent poly-carbonate cover up,trademark of the italian-automaker, which is gently formed offering protection to the heads of driver and passenger. The back is relatively aggressive in nature, boasting a quad-taillight-d esign which widens the car’s rear aesthetic profile.The rear diffuser features an extractor form inspired by jet engine after-burners, and offer a related sonorous sound. 20” solid alloys were created especially for the limited-edition model. The carbon-fiber hard targa top is divided directly into two pieces which can easily put behind the seats. The same J50 introduced during the launch celebration in tokyo is completed in a shade of three-layer red, with a red-over-black interior upholstered in high-quality leather and alcantara.